This pattern is for a basic double crochet baby/toddler sized crochet cardi (American terms). I like to think of it as a blank canvas for you to ‘paint’ with your own choice of colours, textures, embellishments, edgings, ribbing, buttons, zipper or whatever takes your fancy! For my first one, pictured here, I used a cotton/linen mix DK weight yarn and added ruffles, crab stitch and some surface slip stitching for a girly, summery look. Swap ruffles for ribbing and surface crochet for stripes, and you will get a distinctly boyish cardigan. Or leave as is for a classic, gender neutral version. 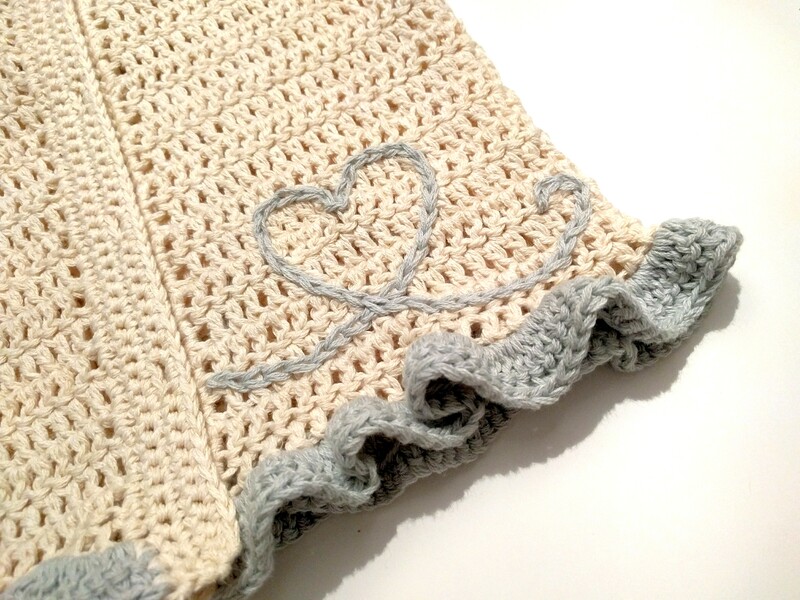 I’d love to see how you choose to personalise it – Please share your cardigans on Ravelry! DK yarn. I used Drops Belle. You can use thicker or thinner yarn if you like – just make the yoke large enough to match the chest circumference measurements above (or try on). When the yoke is the right size, continue to the body section. If you do use different weight yarn, gauge and row count is irrelevant. N.B. In row 1, work your sts into the nub at the back of the chains. This will make it easier to work the collar/neck row(s) at the end. Continue like this, working 1 dc into each st, and 3 dcs into the centre st in each of the 4 corners, until the yoke is the required size. Row 2: Ch 3 (counts as first dc), dc in each st around, turn. Repeat row 2 until required length. Compare with a cardigan that fits the child or try on. Underarm area. Here, I’ve worked 2 rounds of the sleeve. 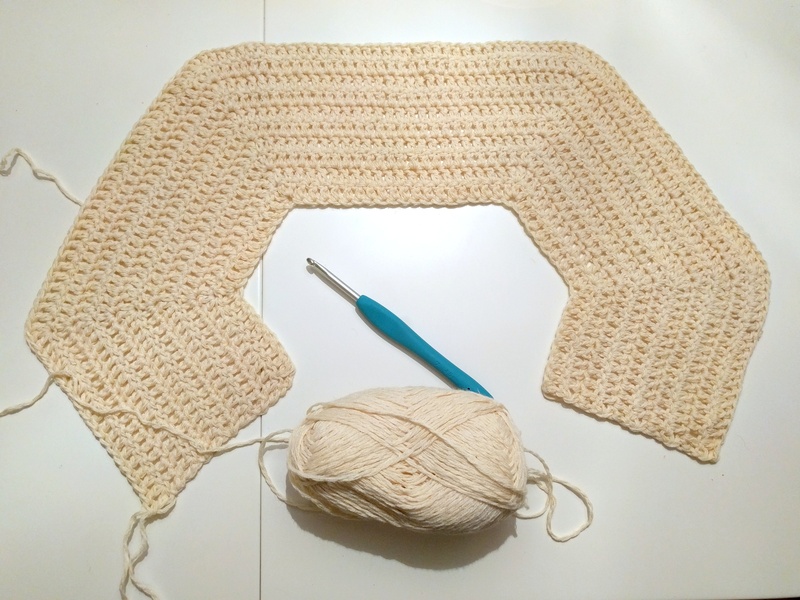 Round 1: Join yarn to centre of underarm, ch 3 (counts as first dc), and work dcs evenly around the arm hole: 1 dc in ea dc around + about 5 dcs into the underarm area (inc. the beginning ch-3). Join to beginning ch-3, turn. Exact stitch count doesn’t matter too much here, just make sure both sleeves have the same number of sts. You don’t have to turn after each round of the sleeves, but doing so will give you the same fabric texture in the sleeves as in the yoke and body. Round 2: Ch 3 (counts as first dc), dc in each st around, join to beginning ch-3, turn. Round 3: Ch 3 (counts as first dc), 2dctog, dc in all sts to last 2, 2dctog, join to beginning ch-3, turn. Repeat round 2 & 3 until sleeve is required length. Try on or compare with a cardi that fits the child. You may find that the neck opening is too wide, especially for the smaller sizes. Row 1: Join yarn to neckline at top corner of right front, ch 3 (counts as first dc), dc in each st of neckline until the first corner, (where there’s 3 dcs worked into the same st), *work 3dctog into the st before, into the corner st and into the st after the corner st, dc in each st to the next corner, repeat from * to end of neckline at top corner of left front. Row 2: Repeat row 1 if required. Join yarn to neckline at top corner of right front, ch1 (does not count as a stitch), sc in each st around neckline. Row 1: Join yarn to bottom corner of cardi, ch 1 (does not count as a stitch) and work 2 sc around the post of each dc all the way up, turn. Row 2: Ch 1 (does not count as a stitch), sc in ea sc all the way down, turn. Now, with stitch markers or yarn scraps, mark where you want your button holes along the button band. Each button hole will be 2 sts. Space them out evenly. Row 3: Ch 1 (does not count as a stitch), sc in ea st until you get to where you want your first button hole, *ch 2, skip 2 sts, sc in ea st until you get to the next button hole, repeat from * until the end, turn. Row 4: Ch 1 (does not count as a stitch), sc in ea st, work 2 sc into each ch-2 space all the way down. Same as other button band (4 rows of sc along the edge), just omit the button holes. Sew buttons. Row 3: Working into front loops only, sc in each dc. In addition to the ruffles, I chose to work crab stitch, or reverse sc, around the neckline and down the fronts for a more finished look. 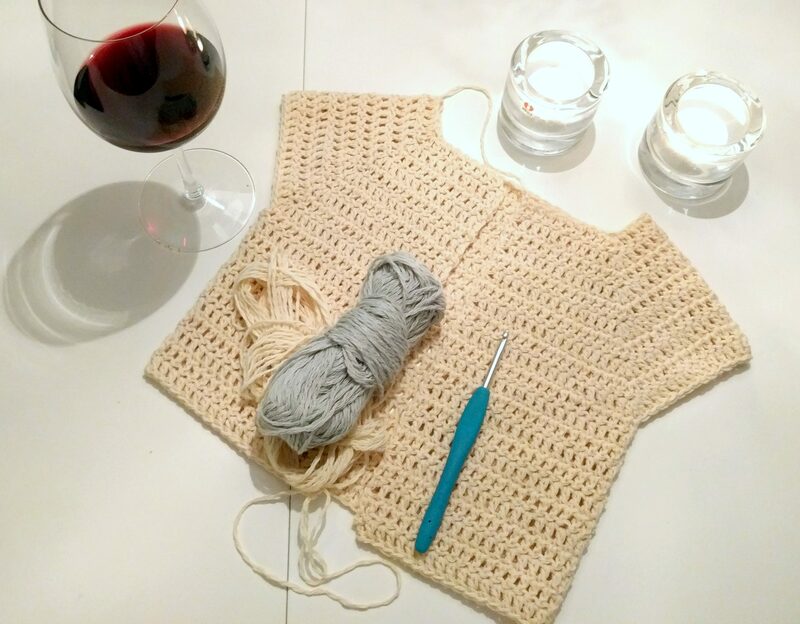 To do this, start in the bottom corner of the left front and work backwards up the left button band, around the neckline and down the right button band. I find that my crab stitch looks neater if I go down a hook size or two. Here, I opted for a 3.5mm. 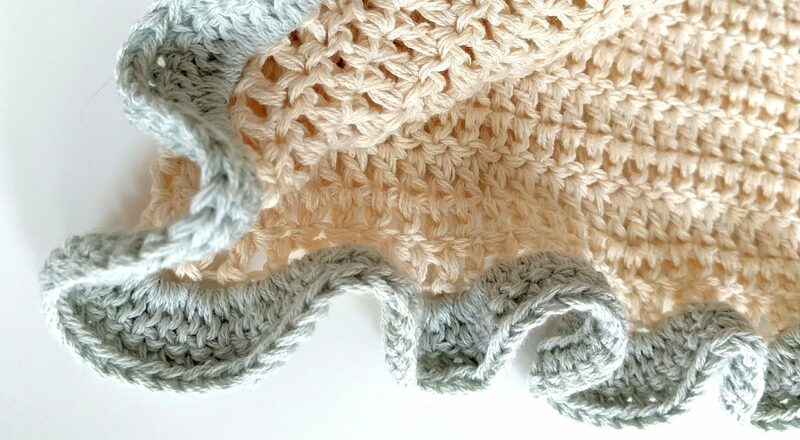 Tamara Kelly has a great tutorial on how to crochet the crab stitch over on Moogly. This is a great way to add interest to plain crochet fabric. I free handed the little heart shape on this cardi. Start with a slip knot, and always hold the yarn at the back of your work. Insert your hook into the fabric from front to back where you want your stitches to start, get the slip knot on your hook and pull it through your work, from the back to the front, insert hook into the next place where you want your stitches to go, yarn over at the back of the fabric, pull through your work and through the loop on your hook to complete the slip stitch. There’s a great tutorial on Dedri Uy’s blog here. I have tried to start this pattern twice but am immediately having a problem with the corners (3dc in next stitch) not matching up. Do you have any suggestions on what I might be doing wrong, or is there an error in the written pattern? 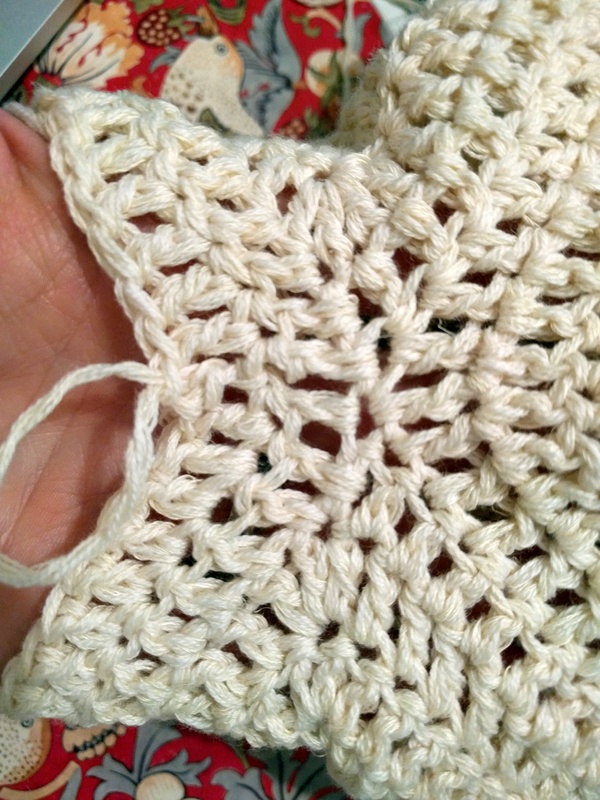 Hmm, so do you end up with the wrong number of stitches in-between each corner or how do you mean not matching up? In Row 2, I start with chain 3 then 9 dc stitches. When I go to do the following “3 dc in next stitch” I am at the top of the FIRST stitch of the “3 dc” in the row below but I believe I need to be in the middle stitch of the “3 dc” in the row below. I am thinking that the paternal should say to do 10 dc instead of 9 dc? Shouldn’t the 3dc fan always be centered on the one below it? Thank you for this pattern. I am very excited about making matching Easter sweaters for my 6 mo. and 4 yr. old granddaughters. I do have a question that relates to the question posted by Kim in Aug. 2016. In row 1, if by making a dc in the 4th chain, 2 dc are created, then making dc in next 8 stitches will result in 10 dc before the 3 dc “fan”. Continuing with the remaining stitches called for in row 1 will then result in 67 stitches rather than 66. Also, the original chain of 60 will not be sufficient to complete the row. It will be one short. When reaching the last section of row 2 following the final 3 dc ” fan”, the pattern calls for dc in remaining 10 stitches. If the row 2 fan is to be made in the middle stitch of the fan from row 1, there will be 11 stitches remaining (1 from the row 1 fan, 8 dc, the first dc done in the 4th chain, and the first 3 chains which were said to count as a dc). It seems that the “extra” dc in row 1 prior to the first fan will result in not ending up in the middle stitch of fans on each subsequent row. I am thinking that the way to deal with this is in row 1 to make only 7 dc following the first dc in the 4th chain, resulting in no further changes needed to the pattern. Sorry for the length of this post and again, thank you for this lovely pattern. I am going to proceed as I indicated, but would value your response as I leave open the likelihood that I have misunderstood some part of the instructions. Thank you for this wonderful analysis and entirely correct conclusion! Well spotted 🙂 I have now, as you suggested, changed row 1 to say dc in the next 7 sts (rather than 8). So glad you spotted this mistake! I love this pattern – I was having trouble finding something in size 12-24 as most things either seem to be sized for tiny babies or bigger kids. Anyway, I’m making this for my friends baby girl and she’s almost 1. I don’t live near her (so can’t measure) and I don’t want to ask my friend to measure something that already fits her as it’s a surprise. I want to add the ruffles at the bottom of the hem and sleeves and was wondering if you can you give me an idea of how long the sleeves/cardigan should be? I don’t want to end up with a cardi down the the baby’s knees or sleeves that drag along the floor and I’m rubbish at eyeballing this sort of thing! Thank you! Glad you like it! 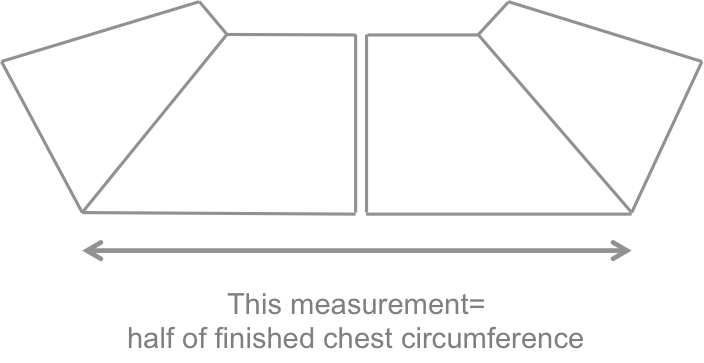 Check out this guide: https://www.craftyarncouncil.com/standards/baby-size-chart for sizing – so c. 8 inches from underarm to cuff. The back-to-waist measurement here is only to the waist of the child, so you need the cardigan to be a little longer, about 11,5 inches from neck down. Hope that helps?